The road to Titus Canyon starts west of Rhyolite. Straight out and gradually rising, the road starts to wind and crosses first the White Pass, then Red Pass, and drops down and past Leadfield. A sign denotes the actual start of the canyon, then things change. The canyon walls become steep and the road narrows. 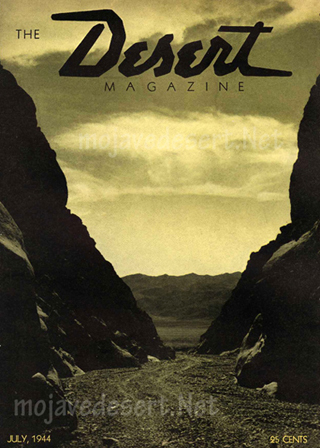 Sometimes no more than 10 feet wide, the road snakes through the crooked and beautiful canyon emerging at the top of an alluvial fan spreading out into Death Valley. Titus Canyon has it all—rugged mountains, colorful rock formations, a ghost town, petroglyphs, wildlife, rare plants and spectacular canyon narrows as a grand finale! Visitors to Titus Canyon often include a stop at Rhyolite ghost town before starting the one-way drive. Don’t expect solitude on this trip. Titus Canyon is the most popular back-country road in Death Valley National Park. Conditions: One-way road from east; this dirt road is rough, steep and narrow; often closed due to snow, mud, or wash outs; two-way section from west is graded dirt road. Warnings: Infrequently patrolled, summer travel not advised. Canyon prone to flash flooding, avoid entering when rain threatens. Ask at ranger stations for current road and weather conditions. From Highway 374 the one-way road heads west across the Amargosa Valley and climbs into the Grapevine Mountains. At White Pass it enters upper Titanothere Canyon. Colorful rock deposits along this section contain fossil beds 30-35 million years old. The fossil skull of a huge, rhino-like titanothere was found here in 1933. 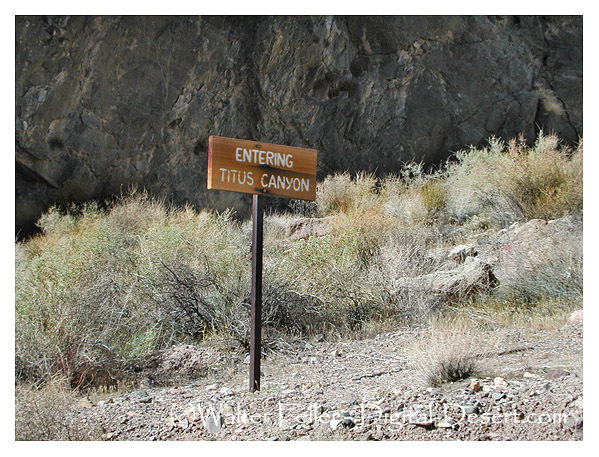 Titanothere Canyon Hike: Those wanting to explore the remote lower reaches of Titanothere Canyon may park where the road crosses the second fork of the drainage. Lostman Spring is a good goal about 4.5 miles down-canyon. 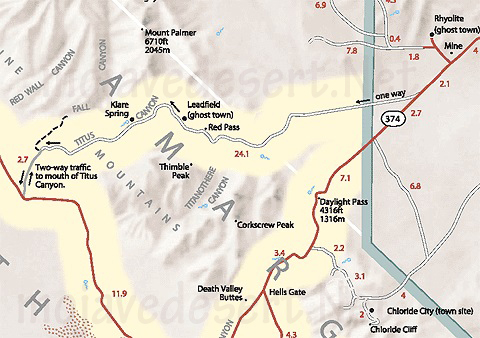 The highest point on the road is this divide between Titanothere and Titus Canyons. Stop to enjoy the grand view in both directions. Thimble Peak Hike: This 6381' peak is the most prominent in the southern end of the Grapevine Mountains. Although not visible from Red Pass, it provides the easiest access. From the left bank of the road-cut, make your way south along rounded ridges. Thimble Peak soon comes into view across a saddle. Climb the north face to the summit. The ghost town of Leadfield "boomed" for less than a year in 1926-27 because the lead deposits bottomed out quickly. All that is left today are a few shacks and a number of mines. Many of the mines are open, but enter at your own risk. Loose rocks, rotten timbers, unexpected vertical shafts, and animals seeking shelter are potential hazards. Just below Leadfield, the road enters the main fork of Titus Canyon. Limestone cliffs rise high above the broad wash; their folded layers reveal the work of great mountain building forces. Rugged, steep slopes provide habitats for bighorn sheep, cacti, and hanging gardens of rare plants. Upper Titus Hike: To explore the upper drainage, park where the main fork joins the road 0.7 miles below Leadfield. Hike up the gravel wash through a broad, colorful valley. A good goal is the narrow side canyon from the right at about 2.5 miles. Bighorn Sheep depend on this small water source for their survival, which makes this one of the best locations in the park to view these elusive creatures. Native Americans came to the spring to hunt the bighorn and left behind petroglyphs pecked into the rock. These ancient designs are irreplaceable, please have respect and do not vandalize them.